One of the most dangerous aspects of global warming is the existence of positive feedback loops. It’s the same thing that causes a high-pitched screech when you set up speakers right behind a microphone: you speak into the mike, your voice is amplified by the speakers, your amplified voice is fed back into the mike, back into the speakers, etc. It gets louder with each loop, until eventually the whole system goes haywire. which will melt the permafrost even more, and the loop will continue explosively until the permafrost is gone and tremendous amounts of methane have been released. 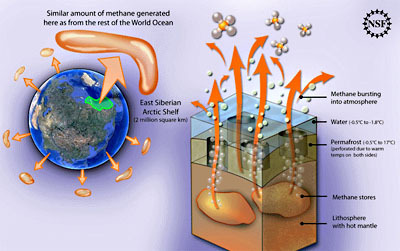 Arctic seabed stores of methane are now destabilizing and venting vast stores of frozen methane — a greenhouse gas 30 times more potent than carbon dioxide. The paper, in the prestigious journal Science, reports the permafrost under the East Siberian Arctic Shelf — long thought to be an impermeable barrier sealing in methane — is instead perforated and leaking large amounts of methane into the atmosphere. Melting of even a fraction of the clathrates stored in that shelf could trigger abrupt climate warming. If this continues, there might soon be no way to stop it. As Joe Romm warns, “It is increasingly clear that if the world strays significantly above 450 ppm atmospheric concentrations of carbon dioxide for any length of time, we will find it unimaginably difficult to stop short of 800 to 1000 ppm.” And if that happens, warming of 5°C or more is inevitable, a catastrophe almost beyond imagining. But the Republican Party continues to believe that if they just deny it’s happening, then it’s not happening. And since they, along with a small cadre of “centrist” Democrats, control the U.S. Senate, we remain unable to take even modest steps to address this. I’ll probably be dead before the suffering starts in earnest, but lots of you have kids and grandkids who won’t be. Even some of you Republicans. Just food for thought.